Celebrate our Ten-Year Anniversary on Thursday, April 19 at the Radisson Hotel in Fargo. Enjoy live music, cocktails, and appetizers. Learn about our plans for the ASAH students and enjoy the trailer for our NEW documentary, Bright Soldiers, scheduled for release next fall. Your presence will make ASAH stronger. Music by Warren Christensen. Cost: $20 in Advance, $25 at the door. 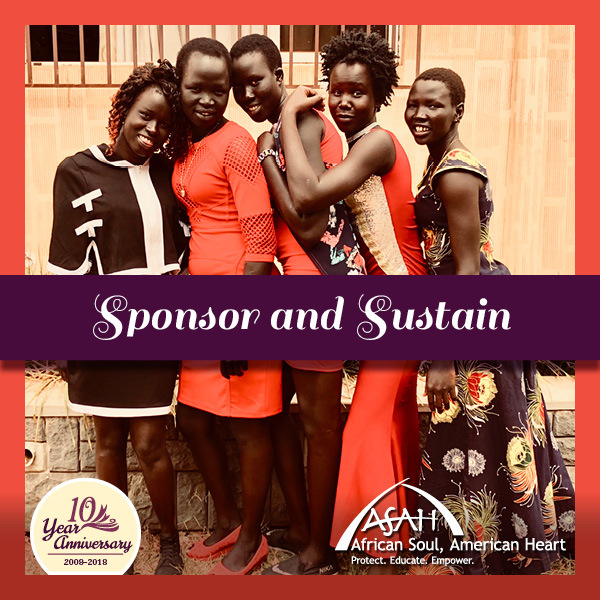 ASAH’s mission is to Protect, Educate, and Empower orphaned girls from the Republic of South Sudan through primary school, secondary school, and beyond. ASAH Protects our students from forced and early marriage, from disease through vaccinations and medical care, and from the civil war. ASAH Educates our students in school subjects and practical life skills to prepare them to support themselves and their families in the future. ASAH Empowers our students to be leaders and to give back to their communities that they may help their troubled nation establish and maintain peace for all. Our 43 girls are in their second year at a top-quality boarding school, St. Noa Primary and Secondary in a suburb of Kampala, Uganda. Our three boys are in their senior year at St. Lawrence Academy. These schools provide our students with a higher quality of education than they have been exposed to in the past and has accelerated their learning of English, the national language in East Africa. Most of our students are not fully sponsored. The cost for their support is about $5,000 annually. Basic sponsorships are available at $1,500/year or $125 per month. Some people share these sponsorships with friends or relatives. One goal for the event is to attract new sponsors. In addition, ASAH is focusing on sustainability to ensure all our students can complete secondary school and go on to vocational school or college. Our second goal for the event is to ensure the ASAH girls have the skills and education they need to support themselves after they leave us.